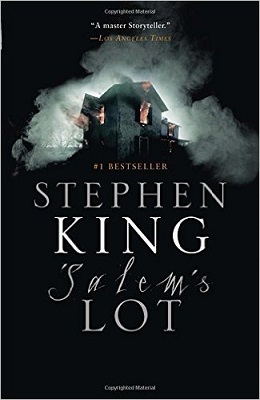 ‘Salem’s Lot was Stephen King’s second novel. It’s set in the fictional Maine town of Jerusalem’s Lot. King planned to name his novel after the town, but his publisher thought the name Jerusalem’s Lot sounded a little too religious so they shortened the title to ‘Salem’s Lot. The central character is a writer called Ben Mears. When Ben was a child he spent four years living in Jerusalem’s Lot with his Aunt Cindy and has some happy memories of the town. Not all of his memories are good though. He once had a bad experience in the old, derelict Marsten House and the memory has haunted his dreams ever since. Now Ben has returned to ‘Salem’s Lot with the intention of renting the house and writing a book about it, in the hopes of exorcising the memory once and for all. Unfortunately for Ben, the Marsten House is no longer vacant. A couple of antique dealers, called Barlow and Straker, have bought it. They’ve also purchased the town’s old laundromat and are planning on turning into an antique shop. Straker makes his appearance a few chapters into the book, but the mysterious Barlow is apparently away on a buying trip. Unable to rent his dream accommodation, but still planning on writing his novel, Ben has to settle for a room in the local guest house instead and has barely settled in when he has a chance encounter in the park and meets local girl, Susan Norton. Susan is quite a few years younger than Ben and when they meet she is reading one of his novels, looks up and sees Ben watching her, and recognizes him immediately from his picture in the book. The pair strike up a conversation and Ben finds he has unexpectedly found a new love in the old town. Ben also forms a firm friendship with the local school teacher, Matt Burke, and he agrees to give a talk to one of Matt’s classes. Both men are well educated and they have a lot in common. In fact, they get on so well together, when Matt notices evidence of vampire activity in the town it’s Ben who he turns to for help. Matt Burke becomes an important character in the story, as does Matt’s doctor Jimmy Cody and a young boy called Mark Petrie—who is also reasonably new to the Lot. In fact, if you have read Bram Stoker’s Dracula, this little group might put you in mind of the one that went after the count. You may also notice other similarities between the books because, when King wrote ‘Salem’s Lot, he wanted to pay literary homage to Stoker’s story. King even mentions this fact in his non-fiction book Danse Macabre. I have read ‘Salem’s Lot twice. I have also read Dracula, and I must admit I enjoy King’s book best. I find it easier to identify with the characters in Salem’s Lot and the story has a lot more to it than just vampires. The spooky old Marsten House, for instance, adds an aspect of the haunted house story to the tale and I am very partial to haunted house stories. If you’re a fan of vampire stories, haunted house stories, or just horror stories in general, I can definitely recommend ‘Salem’s Lot. If your reading tastes usually run to Mills and Boone though, you might want to give ‘Salem’s Lot a miss because if someone is staring into someone else’s eyes it probably means there is some hypnotism going on, love bites tend to be fatal, and the only protection needed is a crucifix.